One of Bordeaux’s greatest virtues is its ability to transcend time. Since its earliest days, Bordeaux’s natural inclination towards longevity coupled with crowd-pleasing volume has enabled devotees to build cellars and plunder mature vintages with almost wanton abandon. Enjoyment is derived not only from the quality of the wine, but also a sense of visceral experience of history and marvelling at the passage of time between insertion and extraction of cork. Nothing compares to the joy of mature Claret: it is more dependable than Burgundy and let’s face it, nowadays relatively cheaper. I spent my entire professional career delving into back vintages, diligently noting every bottle to accumulate a fairly substantial library of tasting notes. Each year I conduct ten-year and twenty-years on retrospectives to appraise how wines are evolving in bottle, singling out those that continue to climb, those cruising along their plateaux of maturity and those on the slippery slope heading towards a vinegary grave. These reports assuage my own fascination and hopefully serve as useful guides for the many that have cellars of mature Bordeaux. Of course, I use the word “guide” since there tends to be more variability with age. As the saying goes: there are no great wines, just great bottles. I intend for “A Century of Bordeaux” to be an annual feature. This article started out as modest retrospectives of 1988 and 1998 to complement the 2008 horizontal published days after I started at Vinous. Nearly all these bottles were tasted at châteaux during various visits (as an aside, the dearth of some châteaux’s library stock often beggars belief considering the scale of production.) Once this was completed, I realized that I was amassing tasting notes on legions of other wines that also ended in eight, in fact, a full complement of notes from every decade ending in that magic number spanning the last century, from a single bottle of 1918 onwards. Restricting our vintage purview to a numerical/chronological theme forces us to consider wines born in great growing seasons such as 1928, underrated seasons such as 1948 and for masochists like myself, maligned seasons, represented here Messrs 1938 and 1968. Unable to cherry-pick solely great vintages makes for a more intellectually rewarding exercise, even if you have encountered a few barely drinkable bottles on the way. These notes derive from the annual Académie du Vin dinner in Bordeaux, all ex-château and often in large format, including a number of esoteric bottles from forgotten vintages, as well as various private dinners themed around vintages ending in “8”. Readers will find 200 tasting notes that cover the last century, and this excludes many withheld for numerous forthcoming vertical retrospectives. (I will tease you by stating that the best 1998 is not included although readers will not have to wait too long!) Each growing season is summarised with commentary upon the wines. In addition, I interweave a parallel story that enhances the idea of a mature bottle momentarily pausing the unstoppable movement of time; wine uniquely a historical relic that we can not only see or hold, but miraculously ingest and consume. It becomes part of us. As such, this article works best if you can spare precious time and read from start to finish, from then to now. Though 1918 is indelibly marked in history as the end of World War I, winemaking continued in Bordeaux. The day-to-day work was carried out predominantly by women since the men were in the trenches. Now long forgotten, 1918 was in fact a very decent wartime vintage with fine summer weather. Picking commenced on 24 September. Like many, I have little first-hand experience of the 1918 vintage, but a bottle of 1918 Citran opened at Domaine de Chevalier was a delightful century-old relic, a pertinent reminder that given sound provenance, you don’t have to fork out astronomical sums for First Growths to experience history. You know, First Growths do not have exclusivity on wines’ longevity...they just have a penchant for it. Nineteen twenty-eight is a copper-bottomed great Bordeaux vintage. A hot summer produced grapes with thick skins and high tannins, structure and longevity. The harvest began on 25 September and yielded rich, dense and alcoholic wines that demanded long-term cellaring. Those with patience were repaid handsomely. Privileged with several bottles recently, the 1928 vintage remains the apogee of a fecund decade of Claret. Wondrous examples from Domaine de Chevalier and Poujeaux again demonstrate that you don’t have to limit your horizons to First Growths to find Claret that continue to offer pleasure in their ninth decade. In fact, my encounter with the 1928 Mouton Rothschild, then under Baron Philippe de Rothschild who had recently introduced château bottling, was underwhelming despite excellent provenance. I suspect there are better bottles out there. Both the 1928 Suduiraut and immortal 1928 d'Yquem attest a Sauternes vintage that produced many astonishing sweet wines that will probably outlast nearly all their dry red counterparts. Nineteen thirty-eight is a completely forgotten vintage, though commentators at the time found them fruity and fleshy in their youth, despite a freezing cold summer. The Féret guide described them as “ripe, elegant and harmonious”. Most wines were belatedly shipped after the end of hostilities. To date I have only encountered two Bordeaux from this vintage, most recently a 1938 Rauzan-Ségla that frankly was probably never much kop even in its youth. I will save the tasting note as it is part of a forthcoming vertical, suffice to say that it was little better than the 1938 Pichon-Lalande whose note I provide. This growing season would follow a similar fate to 1946 being sandwiched between two fêted vintages, though its reputation is high amongst cognoscenti with first-hand experience. It was a fine spring but summer was cool and the vines plagued with coulure. Consequently a small crop was harvested in clement conditions and the wines were known for their masculinity and lack of charm. Quality clusters around the Pomerol/Saint-Émilion border: Cheval Blanc, Vieux-Château-Certan and Petrus are all outstanding but generally, the Right Bank can surprise. 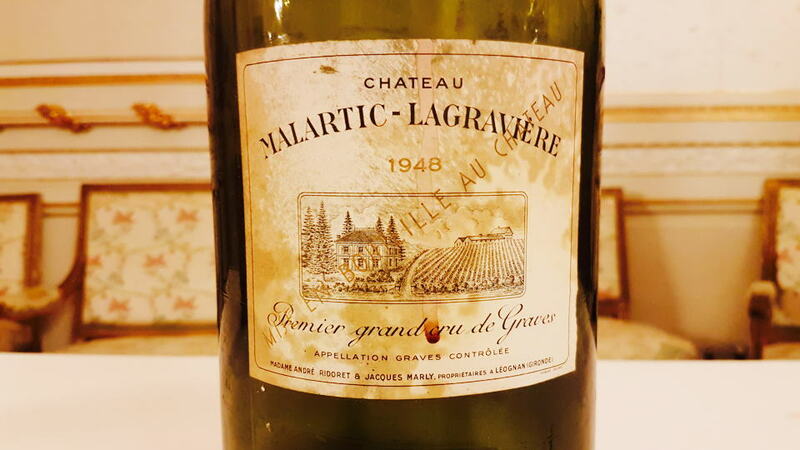 The 1948 Malartic-Lagravière Blanc, served from double magnum at the Académie du Vin dinner (and scurrilously listed as Latour-Martillac!) was a reminder that dry white Bordeaux can mature beautifully over many years when given the chance, likewise Sauternes, here courtesy of a 1948 Doisy-Daëne. What a privilege to drink this wine having met its winemaker, Pierre Dubourdieu just days earlier, still going strong in his ninth decade. 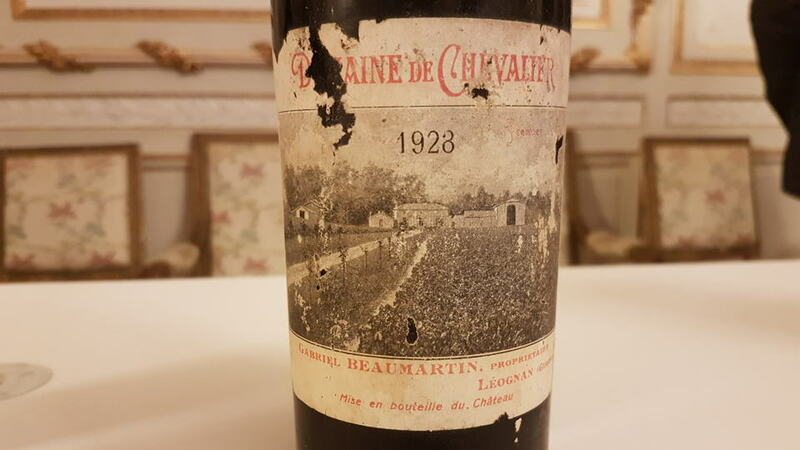 However, neither approaches the jaw-dropping 1948 Cheval Blanc, here represented by a second bottle opened from the same source as the 100-point tour de force encountered back in 2015. Some sages claimed it is better than the legendary 1947. I scoffed at that idea until I actually tasted the 1948. The 1958 Bordeaux vintage was known for its good but short-lived wines that were inevitably over-shadowed by the 1959s. A rainy summer caused outbreaks of rot although interestingly, David Peppercorn MW observed that 1958 was the first vintage whereby winemakers had the skills to overcome the limitations of the growing season. This was the third consecutive late vintage, the harvesters dispatched into the vines not until 10 October. Two recent bottles encountered at the Académie du Vin dinner. The 1958 Canon-la-Gaffelière is a splendid wine, indeed, several bottles from this era suggest that this Saint-Émilion was firing on all cylinders. Still today it is absolutely delicious whereas the 1958 Beychevelle reflected more the challenges of that growing season. In 1968, a freezing cold spring caused uneven flowering and after a decent July there followed a cold August. To rub salt into the wounds, the unripe grapes were actually picked in good conditions, so one can conjecture that had there been stricter selection, this vintage might have been saved. But there wasn’t. I have only tasted one or two wines from this derided vintage. Neither La Mission Haut-Brion nor Cheval Blanc had much to offer. Yet a bottle of 1968 Domaine de Chevalier Rouge cracked open by Olivier Bernard defied all logic and was perfectly drinkable, even enjoyable. It just goes to show – never dismiss a bottle just because of its birth-year. The 1978 Bordeaux vintage is now more fondly regarded than other 1970s growing seasons, but for most of that year, the omens looked bleak as inclement weather augured another poor crop. The spring was rainy and cold and summer did not bother turning up. June through to the beginning of August was cool and overcast, but saviour came in the form of a high-pressure system that lodged itself over Bordeaux in mid-August, in some ways, a forerunner for recent vintages where September saved the day. The weather remained hot and sunny and so châteaux wisely delayed the harvest for as long as possible to help the vines catch up and achieve maturity. Now at 40 years old, the wines are what some might describe as “useful”, not touted enough to drive up prices nor as decrepit as 1973 or 1977. They have always been very “classic” wines of structure and freshness, rather conservative but often reflective of respective château styles. These days you have to choose carefully because 1978 predates the modern era: many properties remained lackadaisical when it came to quality and focused on quality, if only to stay in the black after a run of dismal vintages and low prices. I have included several notes here although there are more to come as parts of verticals. The best 1978s often come from Pessac-Léognan, the Merlot counterbalancing the austerity of the vintage. The 1978 La Mission Haut-Brion is an astonishingly fine wine, a candidate for wine of the decade – yes, it’s that good. Its sibling, the 1978 La Tour Haut-Brion that I tasted alongside to compare is another great wine that might have lost a little vigour in recent years but is equipped with depth, concentration, rusticity and personality. Outside of these, the 1978 Palmer continues to drink well, to a slightly lesser extent than Giscours. Perhaps the most interesting wine included here is 1978 La Fleur-Milon. This Cru Bourgeois was owned by the Gimenez family and sold to the Rothschilds in 2004, whereupon it became part of Clerc-Milon. I picked up a bottle in Saint-Émilion. Served blind, it put in a very convincing showing, attesting why some of Pauillac’s big names were circling when the property came up for sale. Most 1978s will not improve further but have generally held up well. I have fond memories of drinking many Bordeaux 1988s. When I was buying wine for the Japanese market at the end of the 1990s, it was a popular vintage, occupying that sweet spot whereby its wines were appreciated but they were not received euphorically like 1989 or 1990. Ergo, prices remained modest and restaurants lapped them up. They were lighter, slightly leaner wines than that pair, yet fresh and full of vivacity, slightly dry towards the finish, your archetypal “classic” Bordeaux. That is no euphemism. They genuinely gave a lot of pleasure. The growing season got off to a damp start with fairly warm temperatures. April and May were up to 2° Celsius warmer than usual with 40% more rain, necessitating a great deal of spraying in the vineyard to protect the vines against rot. After a cold snap at the end of May, fortunately a spell of clement weather enabled flowering to pass smoothly and despite some coulure and millerandage, it did not impact detrimentally and may have actually improved concentration. There was some hail that affected Listrac, Moulis and part of Margaux and Pauillac at the end of June but July was sunny and warm rather than hot, while August was very dry with just 16mm of rain. In fact by September, despite a couple of storms, winemakers were beginning to worry about drought and vine stress. As harvest approached towards the end of September, predictably late compared to other vintages, the maturity of the Cabernet Sauvignon lying on well-drained gravel soils was blocked. Rain on 12 October prompted some growers to pick early at low ripeness levels, whereas those who sat it out and picked later around 23 October benefitted from those extra days. However, late picking was not passim in those days and a majority had picked earlier, resulting in a raft of quite structured, slightly green Bordeaux in which quality was concentrated at the top of the pyramid, where châteaux were patient to pick and sorted more rigorously. 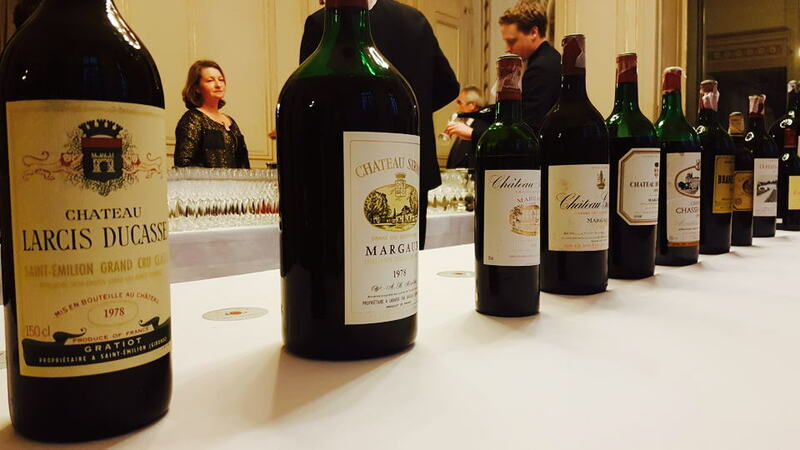 Most of the 1988s in this report were tasted at châteaux alongside their 1998 counterparts, augmented by others encountered during en primeur, again, ex-château. I have a lot of affection for the 1988s. They have given a lot of affordable pleasure over the years. However, revisiting around 50 wines, I gauged that some are now beginning to dry out. Maybe they enjoyed a plateau from the mid-nineties to around 2010 where everything was in balance, but as primary fruit ebbs away it begins to expose their rib-cage tannins and green finishes, whereas 1989s appear to be improving. Those with cellars of 1988s should consider drinking the wines in the near future because they will not improve further. The best, like the 1988 La Mission Haut-Brion, Domaine de Chevalier and Vieux-Château-Certan and, though not included here but in a forthcoming piece, 1988 Lafite-Rothschild, continue to give pleasure in their unapologetically classic style. 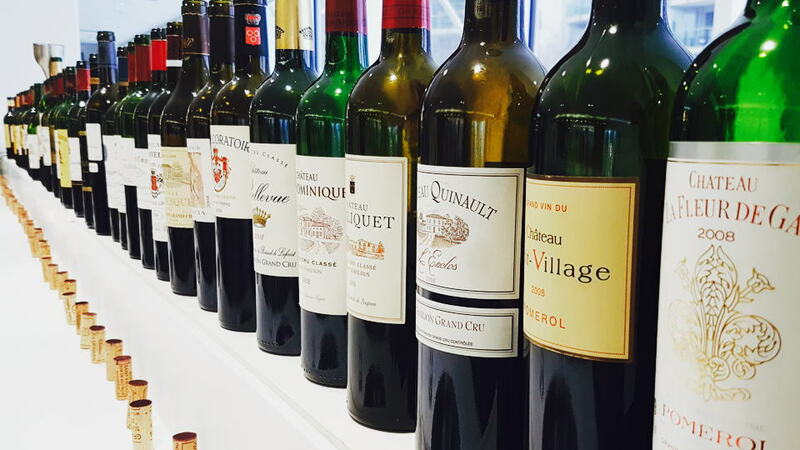 The headline for the 1998 Bordeaux vintage was: outstanding on the Right Bank, good to very good on the Left. It might be seen as a modern day 1964 or 1975 in that the season favoured one over the other. It commenced with a relatively hot month of March that ignited the vines’ growth cycle although the brakes were put on by a damp and rainy April that continued into May. Fortunately in the middle of the month, the weather settled and became warm and dry. Flowering took place under somewhat changeable weather without much coulure and as the end of June approached, temperatures soared in line with optimism. July threw a spanner in the works. I can remember visiting Bordeaux under grey and overcast skies, walking around Pavie with Gérard Perse just after he acquired the estate, dressed in a warm coat. Hail struck Pomerol that necessitated vineyard managers to conduct some green harvesting, which could account for the eventual concentration in the wine. August was extremely hot, especially between 7 and 11 August when it was over 100 degrees Fahrenheit, thereby causing burnt berries or grillure. Some vines, particularly on well-drained soils, began to suffer hydric stress and shut down, not dissimilar to the blockage suffered ten years earlier. The berries produced thick skins that portended the dense structure of wines on the Left Bank. Thankfully, a three-day spell of rain starting on 2 September was the catalyst to restart the cycle and despite a downpour on 11 September, the vineyards were so parched that it did not impact too greatly. Clement conditions between 15 and 27 September made it an ideal window to pick the Pomerol and Saint-Émilion grapes, after that followed a rainy period where almost 70mm fell over Bordeaux. This put Left Bank châteaux in a quandary. Should they go out and rescue the unripe grapes or risk waiting? Much was picked on the first half of October throughout the incessant rainfall that denuded the Left Bank the quality of the Right Bank. I have a rather controversial view on the 1998 vintage. Yes, it is a Right Bank vintage. That is obvious from my tastings that were conducted at various properties in recent weeks. However, my enthusiasm for the Right Bank is tempered by the style of the wines. This was an era when the garagiste movement was rapidly gaining influence. I take the view that this had a positive effect upon Bordeaux, made people sit up and think, although its winemaking practices sometimes nudged the style too close to the New World for my own personal taste. I completely understand why many people love this vintage however, I am just not quite as seduced as others. Hence my more parsimonious scores for the likes of Troplong-Mondot, Tertre-Rôteboeuf, Nénin, Clos l’Eglise and Figeac. One exception is the instigator himself, Jean-Luc Thunévin whose 1998 Valandraud continues to drink beautifully. Revisiting the vintage 20 years on, there are many pleasant surprises elsewhere. It is a Right Bank vintage, but it does not have exclusivity on the best wines. 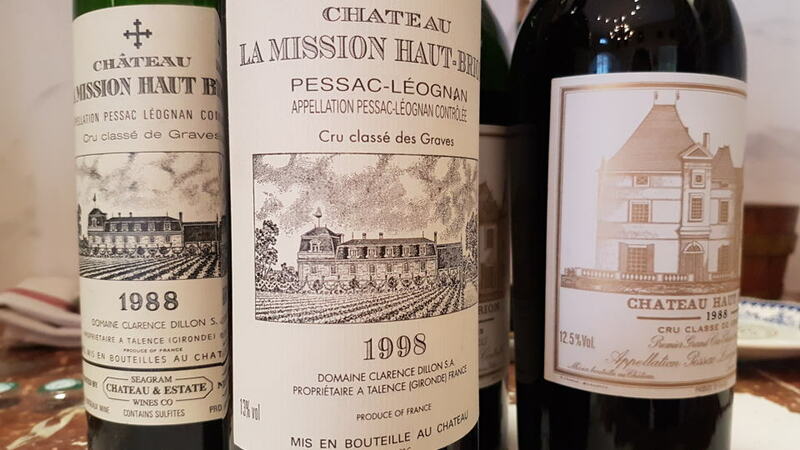 Pessac-Léognan performed extremely well: the 1998 Haut-Brion is perfect for those that can ill afford the 1989 and frankly, not that far behind in terms of quality, likewise a brilliant 1998 La Mission Haut-Brion and Haut-Bailly. It is not a consistent vintage, the 1998 Domaine de Chevalier a few steps behind my expectations and as for 1998 Pape-Clément... I always considered this a period when its wines were over-extracted and unnecessarily pushed too hard. At 20-years old, the Pape-Clément seems to be drying out and charmless. Fortunately, the winemaking team changed course the following decade. On the Left Bank, at 20-years old, there are some good, if not a plethora of great wines. Even from barrel the 1998s lacked a bit of charm, predestined to be over-shadowed by the Right Bank. In some ways, they evince a time when winemaking techniques were as “haut couture” as nowadays, therefore tannins tended to be coarser and less refined. Good-bye London. I am now living in Guildford with a different wife; cats exchanged for two girls aged three and one. Life revolves around fatherhood and infinite joy that brings. My career took another unexpected turn when my website became successful and two year ago, began working for Robert Parker. My knowledge of fermented grape juice now extends beyond Matéus rosé. I still visit my hometown and occasionally drive past my grandparents’ house, long sold and rented out to strangers. Dad still works at the same insurance company. I will not dwell on this vintage since I covered the growing season and wines in my first report for Vinous. The notes included here are in addition to those, tasted blind from ex-château bottles at Farr Vintners at the beginning of March. My parents, Nick and Maureen live in Southend-on-Sea with a menagerie of pets, dad having finally retired after spending his entire career at the same firm. Guildford is now home. This year I began working at Vinous, although there are no reviews of Matéus rosé...at least not yet. On my wall hangs a photo of Eric sailing on the Thames and another of Winnie smiling for the camera in a children’s playground. My daughters, growing up far too quickly, don’t really know who they are. At least at the moment, in their eyes they are part of history since their lives do not intersect. Then again, where would I be without them? And as for the vintage 2018, like all our lives, that is presently unwritten.